This post is the first in a series. I am going to look back at my TTEDesigns evolution thus far. I have been seriously pursuing TTED for about 18 months. Prior to that I made jewelry for several years, for myself, for fun and gifts. With the encouragement of family and friends I stepped out into the world. I didn't have a plan or even really know how to proceed. There are some business books at the library (boring & dry) and tons of info on the web, interesting but not always reliable or feasible. So good or bad, I took the plunge without a net. First I knew I needed business cards. I checked around and found a good deal with Vistaprint. I had the ability to choose my own designs, fonts & colors. I picked something light, fun and frivolous. I used a crazy font, had a vague, simple saying and minimal information. I remember struggling with the title. 'Artist' or 'Artisan' seemed so much more than I really felt that I was. 'Owner' seemed too vague so I settled on 'Creator'. At least it indicated I made the items. I see now that it was lack of confidence that lead me to that choice. My name was not prominent, and the information was unobtrusive and subtle. At the time I was using white table cloths with some old purple curtains for my table display so I thought it worked. I decided to change colors to reflect my show set up, to make my name more prominent and to leave off some of my personal information. My display had evolved away from white and purples to white, black linen and khaki suede. I changed my vague saying to something more confident . I felt better about my design skills so I wanted my name bigger. Lastly, I knew that cards lasted 9-12 months and we would be moving out of the area in the summer so I didn't want to use my local address and have the cards give wrong information. I settled on this design, a more vintage look. So, I've had these about 6 months. We are moving this month and now I have added not only the Art Fire account, but this blog and a website. 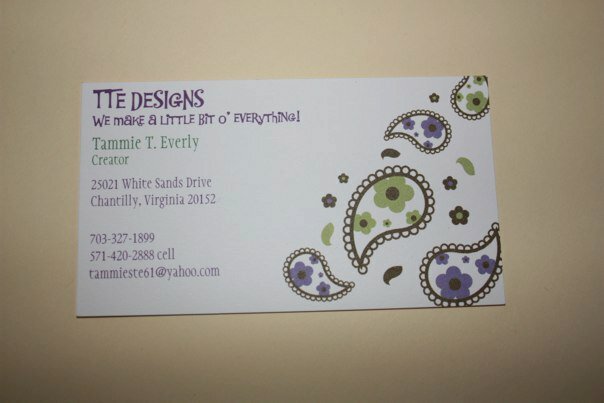 Additionally, I have seen many inspirational uses for business cards such as earring cards and packaging accents. I think I will hang onto these for a few months until I am more settled in our new town but I for see yet another evolution in the search for the perfect business card. Excellent post! I, too am getting ready to order new business cards! Thanks for sharing your thought process! Best of luck with your move!